I wore #6, the long, strapless, black dress that was actually a bridesmaid dress for my friend Michelle’s wedding. But you don’t really care about what I wore, do you? My husband works in Hollywood and the premiere was downtown, so I picked him up at work and we got there early to get our tickets. 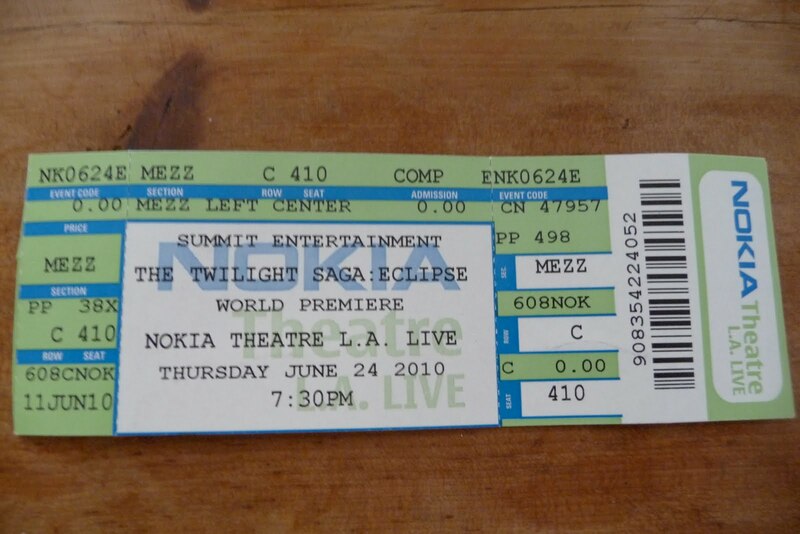 If we didn’t pick up our tickets by 7:00pm for the 7:30pm start time, they would give away the tickets. The line for our portion of the alphabet was about 5 times longer than any other line, so we waited and waited, just to pick up our tickets. At this point, after waiting in line for at least 45 minutes, I thought my husband was going to just leave me there and go home. He was not really having fun. 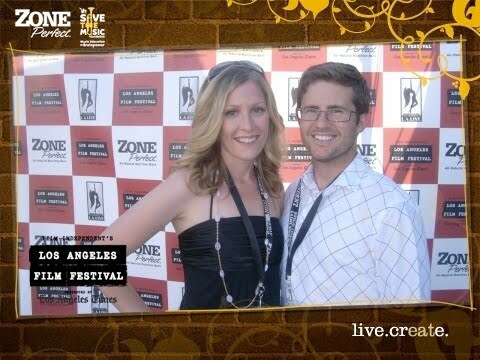 My feet were already aching, but I was starving and he needed a cocktail, so we checked out the LA Film Festival Lounge on the roof of the parking structure. They took this photo of us right before we walked in. I was glad we got some kind of picture of the night because the information we received explicitly stated that no cameras or camera phones would be allowed inside the theater and that we should leave them in the car or they would take them away. The lounge was empty and kind of lame. I got a gross margarita-type drink, but gave it to my husband after a few sips. They didn’t have any food, just these zone perfect bars (obvious sponsor), so we decided to go find a place to get some grub. After fighting our way through the crowds (psycho Twi-hards were EVERYWHERE), we ended up at Flemings and had some wine and calamari. When we left it was 7:00, so we rushed limped (I already had blisters) back to the theater to get our seats. 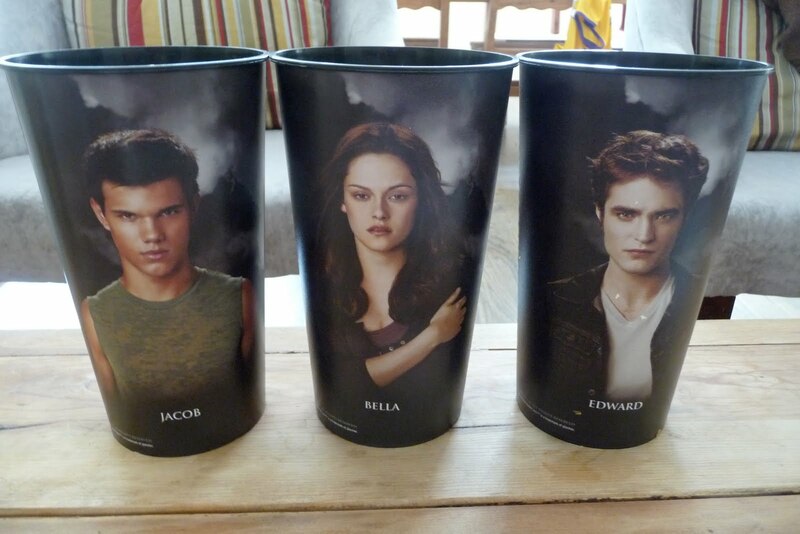 We picked up our free popcorn in these awesome cups (don’t worry, they’re going in the camping supplies), which were supposed to be one per person, but my husband stole and extra so we could have all three characters. We also got free soda! We soon realized that there was no way the movie was starting on time. It was already 7:45 before any of the important people showed up. They played the red carpet arrivals in the theater while we waited. Dude – I really can’t stand Kristin Stewart. Her whole “I’m too cool to smile at the camera and act like a normal human being” act completely pisses me off. Get over yourself. And who took your other sleeve? We saw Kristen, Rob, and my personal favorite, Taylor all come in and take their seats – well, actually, we heard the screams of all the 14 year olds in the audience, then we looked down at the orchestra level and saw a girl with only one sleeve and a guy in an ugly red suit and another guy… actually I couldn’t tell Taylor from his entourage and then we realized that they were finally inside and the movie would start soon. Oh and BY THE WAY, everyone and their mother had cameras and phones. I was super annoyed that I didn’t have mine because I totally could have gotten some really far away shots of the cast members walking in. BUMMER! My husband was not a happy camper and said that he didn’t want to go to the after-party because it would be too crowded and he just wanted to go home. I was disappointed, but figured he was probably right. We watched the movie – which I really enjoyed, even with the endless 14 year old girl screams every time someone kissed, or took his shirt off, or whatever. It was funny and action-packed and sweet. I read all the books last year, but totally forgot what this one was about so it was nice to let it all come back to me. When the movie was over, we stayed until the end of the credits and headed out.